The Senate on Thursday, in a squeaker vote of 50-49, confirmed White House homeland security specialist Kathy Kraninger to be director of the Consumer Financial Protection Bureau. The vote came as the agency was defending the move taken earlier this year by acting Director Mick Mulvaney to change the bureau’s name to the language used when it was created under the 2010 Dodd-Frank Wall Street Reform and Consumer Protection Act—the Bureau of Consumer Financial Protection. One of Mulvaney’s legacies, the name change to the government’s newest agency that had spent seven years building its brand, came into question this week when The Hill news outlet obtained an internal bureau document suggesting that the cost to the agency and industry could be as high as $300 million. The name change on the website of the bureau itself is a work in progress, with a goal of completing the adoption by March, the internal analysis said. 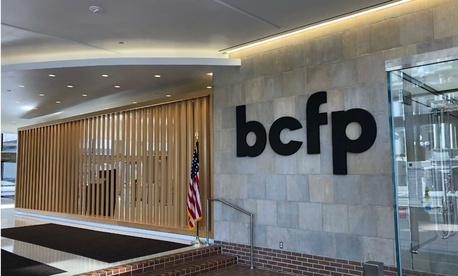 (The home page still states, “We’re the CFPB.”) Mulvaney’s directive in June prompted replacing the large lettered sign in the bureau’s lobby—and he also removed the outdoor sign that the agency’s building sported under previous director Richard Cordray. A quick Government Executive review shows that financial industry groups, such as the American Bankers Association and the Independent Community Bankers of America, took several months but by this fall had begun using the name Bureau of Consumer Financial Protection. Journalists, however, as typified by the Associated Press, have continued using Consumer Financial Protection Bureau, including the New York Times, Washington Post, Wall Street Journal, American Banker and Government Executive.